Dry it, you will like it! 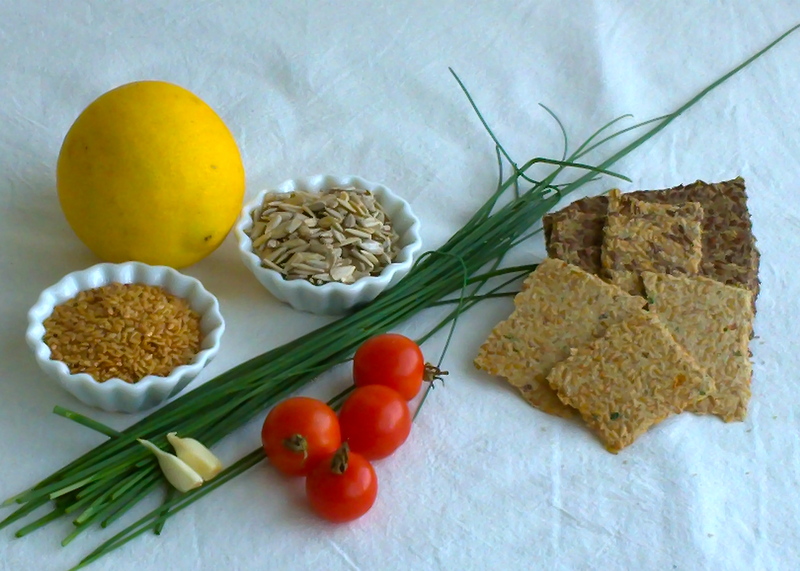 A comprehensive class on dehydrated raw foods. Join us and come along! The investment is $60/person including all samples (I’m working on them :-)) and a comprehensive recipe booklet. If you have a dehydrator and you want to use it more come along! If you are thinking of getting one come along too! René will share some advice on what to look for in a good dehydrator. 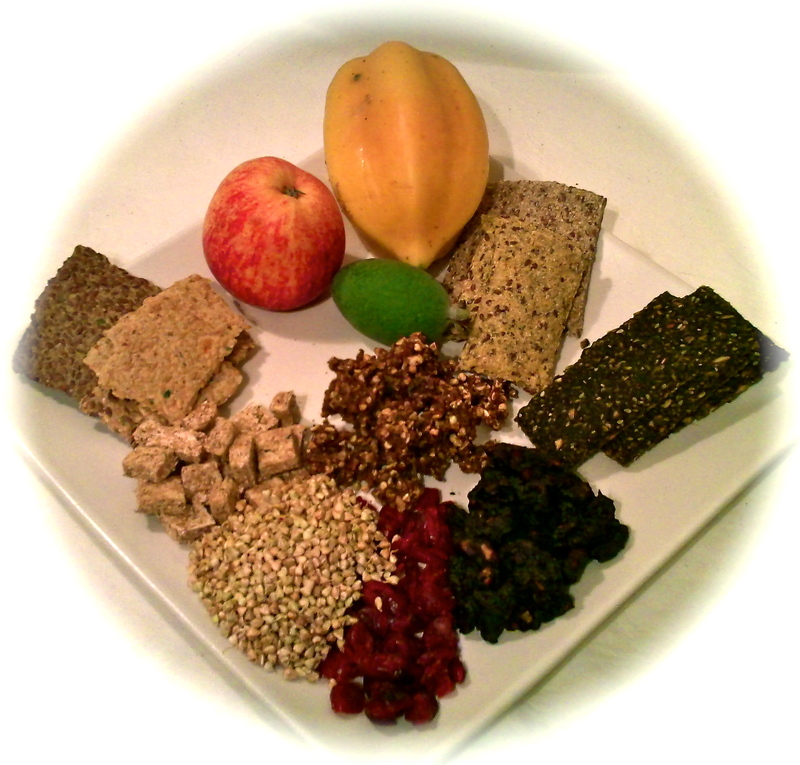 Either way, you will come out of this class with more confidence and knowledge around dehydrated raw foods. Spaces are limited to 20 people and bookings are essential. You can contact us directly to book your place, either by clicking here and leaving us a note or by ringing René directly on 0275551622. We are looking forward to having some good fun together! PS: More classes are coming up. Please see our Teaching page! Yes, yes, yes! Another one of our favourite recipes and a staple in our pantry (top shelf, second jar from the left, right beside the chocolate walnuts – yum!, Maca/apple spice granola, buckwheat pizza bread, and the almond bread croutons). This recipe came about after a bit of trial and error. Nothing fancy but it works – as long as you keep the ratios approximately in proportion. I encourage you to experiment with other ingredients too. 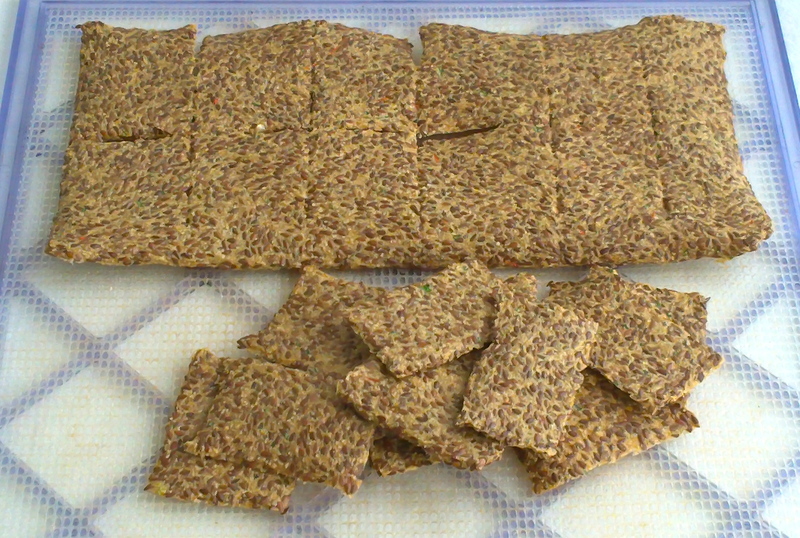 Try other nuts or seeds instead of sunflower seeds, or some other vegies that are in season when you make these crackers. Zucchini or bell peppers will be fine. As you can see in the pictures that follow, we are using the good old Excalibur dehydrator. This recipe will work equally well with any other dehydrator. The linseeds don’t have to be golden if you can’t get them. The brown ones will do just fine. 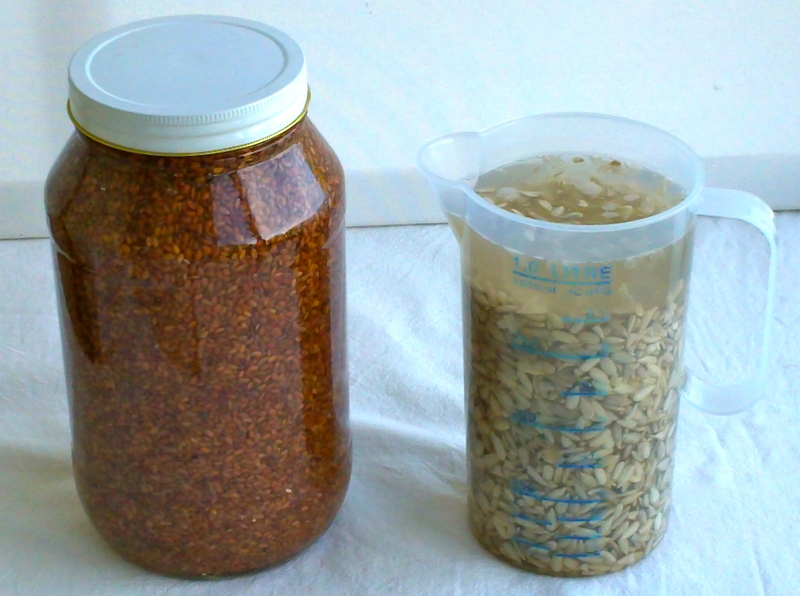 I use the terms ‘flax seeds’ and ‘linseeds’ alternatively. They are the same. 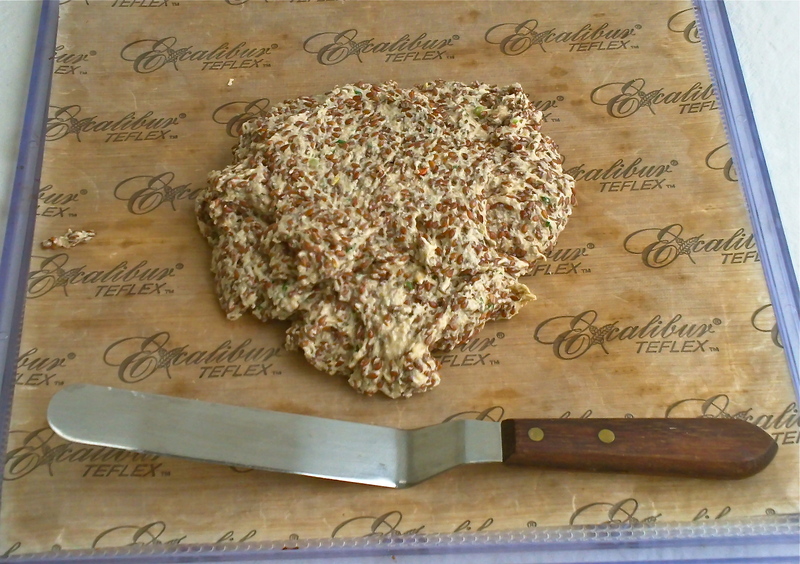 Set the soaked linseeds, linseed meal, and chives aside. In a food processor, combine the other ingredients and process until smooth. 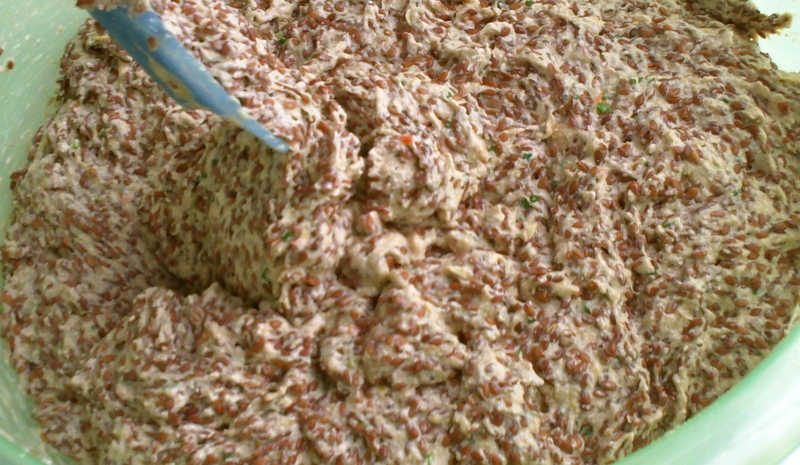 In a bowl combine with chives, linseed meal, and soaked linseeds. Hand mix well. 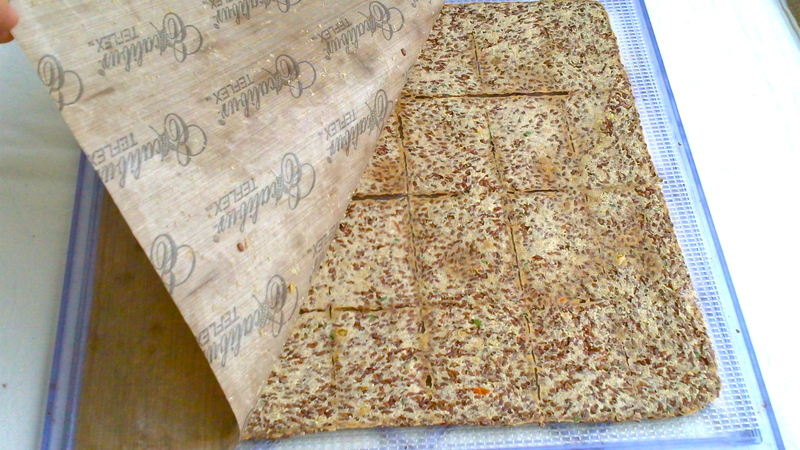 Using an offset spatula, spread the mixture onto Teflex dehydrator sheets, forming eight 25cm squares about 0.5cm high. If your batter mix is thick enough score the tray into individual crackers with your spatula now or dehydrate at 145° F for 1 hour, then with a pizza wheel or carefully with a big knife score into crackers of equal size. 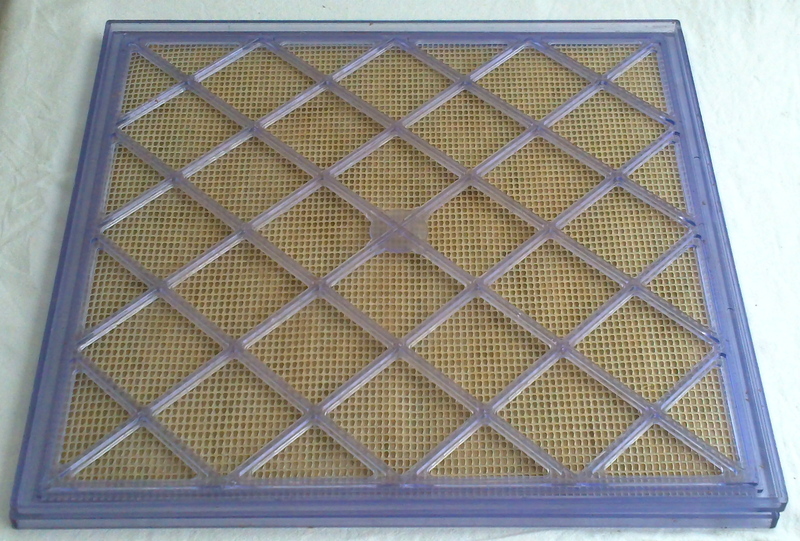 Rotate the trays regularly both horizontically and between the different slots in your dehydrator (Excalibur). 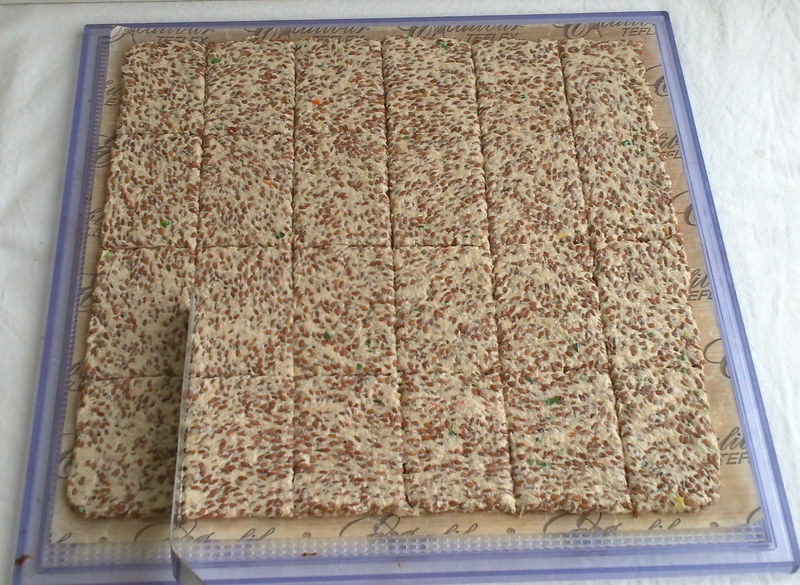 Turn down the temperature gradually to 115° F as the crackers dry. 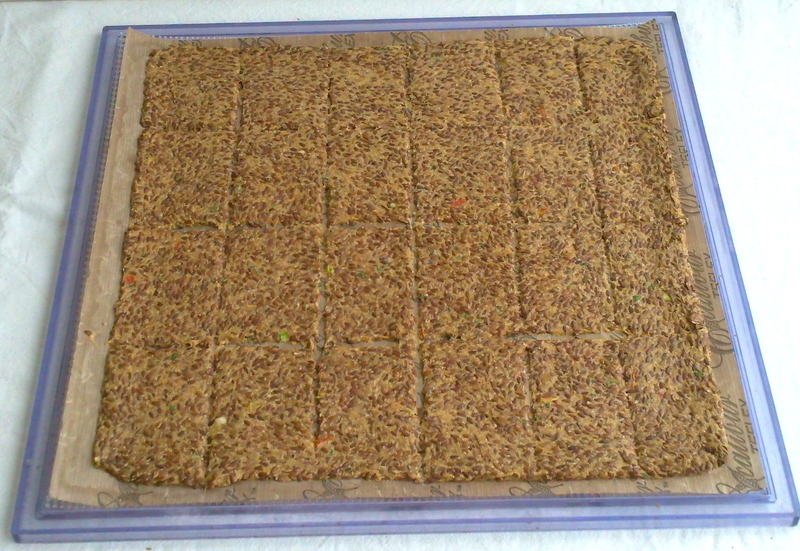 After 4-6 hours flip the cracker sheets and remove the Teflex sheets. Continue to dehydrate at 105°F for about 12 hours or until crisp. Store in sealed glass jars (see picture above). And here is the whole story in pictures. Enjoy! A thick and moist mix. about 2c of batter per tray, get yourself one of these cranked spatulas! This tray is dry enough to flip onto another mesh tray. 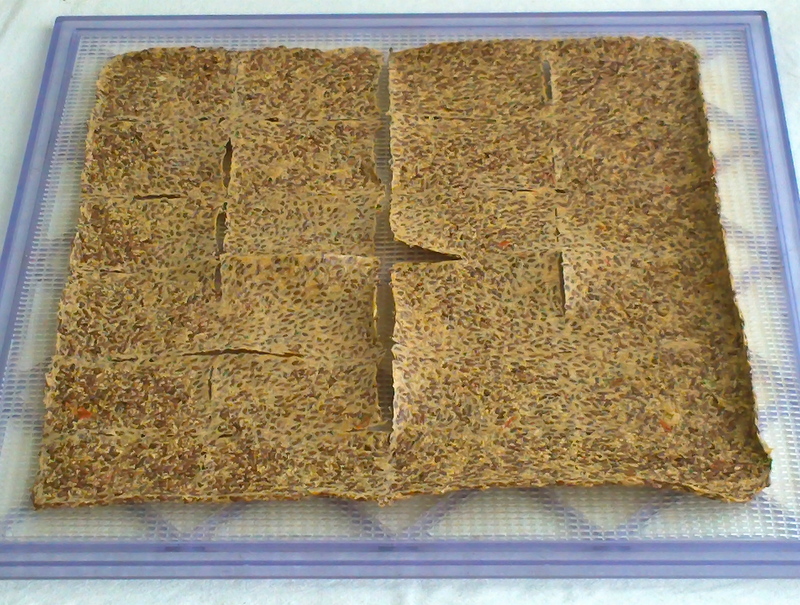 Place a mesh dehydrator tray on top of your pre-dried cracker tray. Hold both trays together and turn over. You see the previous bottom tray now on top here. Teflex sheet is pointing up. 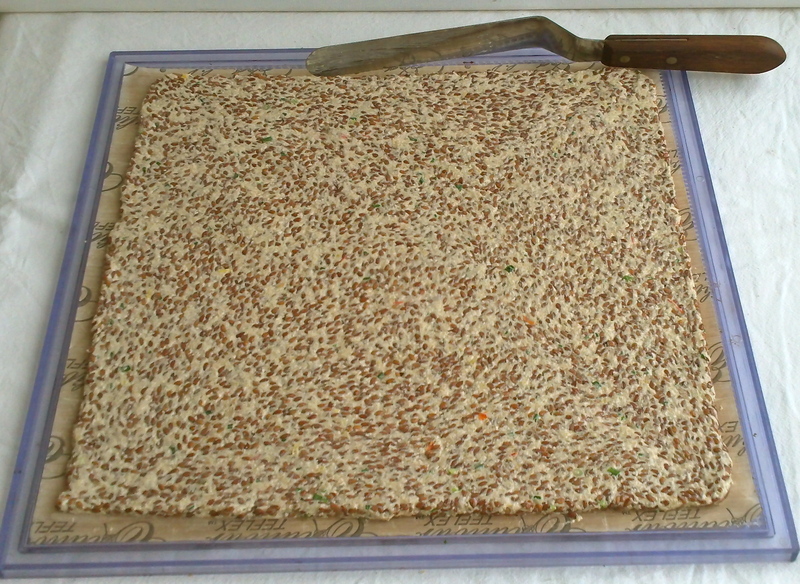 Now carefully peel off the Teflex sheet and put the tray back into the dehydrator to finish drying for approximately another 8 hours on 115-105 degrees F.
If batter still sticks to Teflex sheet. Reverse the last steps and dehydrate longer on the Teflex sheet. Pictures of the finished product is coming tomorrow morning. They are still drying. Here is a finished tray. Just break them apart and store in a sealed glass jar. Voila! The final product after 24hours!